We started on this journey 17 years ago, pretty much with no clue what we were doing. 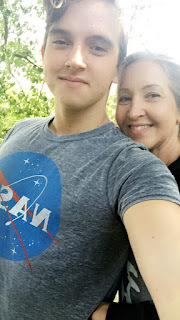 Hubby and I were both public school graduates, who leaped, both feet first, into the world of homeschooling with our five children. The three oldest had a year or two under their belt, the youngest two never stepped inside a school building. It was hard, wonderful, scary and fulfilling all at the same time. I know that is one my greatest achievements here on this earth. 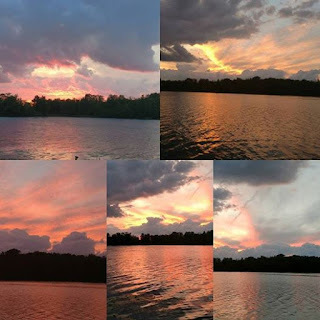 Amazing sunrises and sunset on our little lake here in mid-Michigan have me pulling out my camera more and more. The view is just amazing. I sat last night and watched it as it changed from bright orange to purple and pinks to yellow and grey. I get inspired often from nature and had the idea last night to do some fiber dyeing and see if I can match these amazing colors and patterns. Dyeing has been one of those fiber things that I would love to do more of, but there is definitely a technique to awesome colors and some people do it really well. I am hoping to trying some natural dyes this year using some of the wild berries and plants we have all around us. For now I will be purchasing some fiber dye in hopes of mimicking some of the beautiful colors and patterns. Anyone who raises animals will tell you there is a downside to it. Whether that's mucking stalls, limited travel, making sure everyone is healthy, butchering day or shearing day, there is the good the bad and the ugly to it all. I have been raising animals for 15 years now. Our little farm started out with a flock of laying hens and morphed into meat and laying chickens, turkeys, angora rabbits, pygora goats, alpacas and mini ponies. The chickens and rabbits remain with us here today. 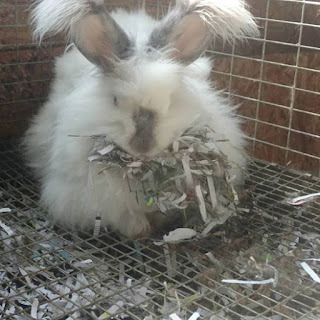 Angora rabbits have a lot of upkeep in themselves. You have to stay on top of grooming for the health of the rabbits. High quality feed and clean water is a must daily. Then there is the dirty job of cleaning cages. I had high hopes when we moved here to create a rabbit barn that I would be colony raising most of my rabbit in. Due to finances and life, that still hasn't happened. This will hopefully be something we are able to do in the next year or so. In my last post I had mentioned there was a lot of things happening with our family. One of those big things going on is another wedding in August! Our oldest will be getting married to a sweet girl we love and adore. I am trying to help out with as much as they need me to. I am always considered the "crafty one" in the bunch so I am working on cupcake trays for the reception. 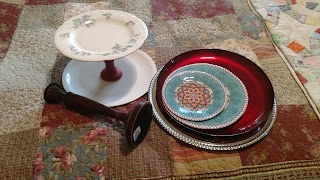 I have been scouring thrift store for candlesticks and plates and trays that I can glue together and use for trays. Having now spent all four seasons at the lake house we have learned that there is definitely a rhythm that happens. We are fortunate to be in a place that is mostly "weekenders" and there are less than 20 houses on the entire lake. Winter's here are peaceful and quiet. Docks come out in September and we don't see most people back until April or May. 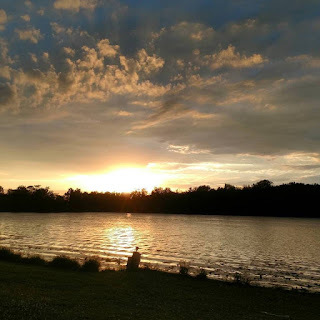 We also live on a chain of six lakes so summer traffic might include visitors from one of the other lakes but usually by 7-8 pm things quiet down. With last week being July 4th we saw the busiest week of the year here. Most people spent the week at their cabins and what seems like never-ending fireworks went on for days. Now here Monday morning most people have left and we are back to our quiet days on the lake, which we love. As I try to work my way back into regular blogging, I decided photos would be a great start. This is just a small window into the place we now call home. I think I started blogging regularly way back in 2005 (which just blows me away!) I have created a blog journal of life on the farm. I would like to start doing more of that here at the lake house. I have a TON of life to blog about right now that it almost overwhelms me. So much has changed in the year and a half since we moved here. Some bad, some good, but isn't that just how life seems to ebb and flow sometimes? We seem to be in a deep valley of change and difficult things we have been dealing with. But there are glimpses of joy (like becoming a grandma in January!) mixed in and you realize life is good and blessed no matter what is happening around you. A year ago tomorrow we moved to our dream house on a lake. I won't lie to you, it hasn't been an easy transition. I miss the farmhouse and the amazing little farm we created. I miss my goats and turkeys, and big garden. Heck, I even miss my two grouchy alpacas. But, I've realized the last few weeks that "Being a farmgirl is not about where you live, but how you live." -mary janes farm, holds so much truth. I don't have to stop doing the things that bring me so much joy just because we changed zip codes. 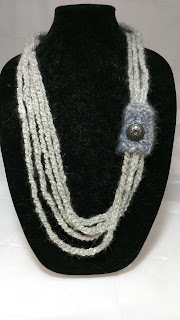 My Rhema Creations...a Fiberarts adventure! All about the soaps I make. Regarding Education: Are We Asking the Right Question?